Coventry City boss Mark Robins was quick to praise his side for becoming the first team to stop Luton from winning after scoring the first goal during their 1-1 draw on Sunday. When Matty Pearson's header burst through the hands of keeper Lee Burge on 17 minutes, it was the 20th time Town had moved in front, with the previous 19 games all ending in a Hatters victory. However, this time, the Sky Blues hit back through Jordan Shipley before half time and went on to keep a clean sheet in the second period to earn a point. Robins said: "Luton is a really hard place to come and it was a tough-earned point, it’s the first time this season they’ve dropped points after scoring the first goal, so that’s very pleasing for us. "We conceded a really rubbish goal, we’ve been working on drills for hours like that, but we still conceded it, it shouldn’t have come to it. ‘’Lee Burge should’ve saved it, fortunately he made amends right at the death to keep us in it and pick up the point in the end as it was their last chance. 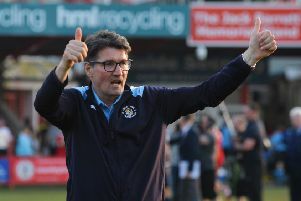 ‘’Luton are a really good side, it took us a while to get used to it and get our foot into it, but once we did get our foot into it we looked good too and caused a threat. "’We had a young team who all played really well and stuck at it. "We lost (Abraham) Bakayoko early doors, he should’ve won a penalty, from where I was it was a clear penalty. "Following that we scored a good team goal for the equaliser, it was a hard-earned point, but deserved which we worked hard for."